No one provides a more all-inclusive program than PRG. The standard package includes: lodging, all food, all drinks, guide, assistant guide, local transportation, single rooms at some locations, license, and access fees. In addition, PRG is proud to supply each guest with ALL flies and a complete line of loaner gear such as: Simms waders and boots, Hatch Reels, Winston Rods included in the price for guest use. How do I decide which trip is right for me? If you know what you want, tell us and we’ll work with you to design a perfect trip suited just for you. If you want some advice, we specialize in custom itineraries for each guest based on their skill level, desires, and available time. Since we have over ten lodging choices and dozens of rivers spread over three regions, our offerings might confuse you. Trust us, and we will ensure you get exactly what you want and will blend an incredible trip with the most variety, best fishing, and accommodation to match your desires. How many days is the average trip? Most first-time guest stay for a week and sample one of our programs. Nearly every repeat customer books a slightly longer stay to enjoy two or even three regions during the same trip. We are able to book shorter stays, but it’s recommended that guests try to dedicate a full week to the program. There are just too many great places to see and too many fish to catch. Do you really fish a different river daily? Yes! We love to show our guests a great variety from desert to rainforest and everywhere in-between. Patagonia is a diverse land and our area has many “microclimates” offering guests the ability to fly fish in many different kinds of rivers, spring creeks, and lakes. It is possible to fish a different river for up to twenty days! When is the best time to book a trip? Spring, Summer, or Fall! Fishing changes on each river throughout the seasons, and no matter when you visit from Dec to May, we are able to provide the highest quality fly fishing. A better question is when can you come? Choose the best dates for your work schedule, family, and let us know that date range. We’ll then go to work matching you with the best fly fishing for that time of the year based around lodges that have proximity to the best water. That is the beauty of having so many rivers and angling choices, and guides that know each piece of water and have been fishing them for many years throughout the seasons. Do you really provide all the gear? Yes! We provide every fly, leader, and piece of tippet throughout your stay. We also have a full line of new loaner equipment for your use from Simms waders and boots to Winston Rods and Hatch Reels. All of our fly fishing gear is top notch and designed for the purpose, and our fly selection has been developed over fifteen years fishing in Argentina. There is no catch. We have been continually working on and perfecting our fly fishing, cast & blast, and hunting programs for over a decade. We started small and have grown organically over the years. Today, we provide the highest level in service, lodging, and fishing in all of Patagonia. If you don’t believe us, please ask for references and we are happy to provide some in your area or you can contact a booking agency and we are confident they will concur. My wife doesn't fish or isn't really into fishing, should I bring her? What's the difference between PRG and other outfitters? There are many lodges and quite a few guides in Argentina, but careful planning is needed to make the most of your trip. Rance and Travis cut their teeth fly fishing and guiding in Montana and have a special understanding of what American guests want and expect. They have created a culture and program unlike any other in South America – many say the world – by training and rewarding their guides and employees to the highest level. Guests that have been repeating for the past decade see the same faces and enjoy long lasting friendships. 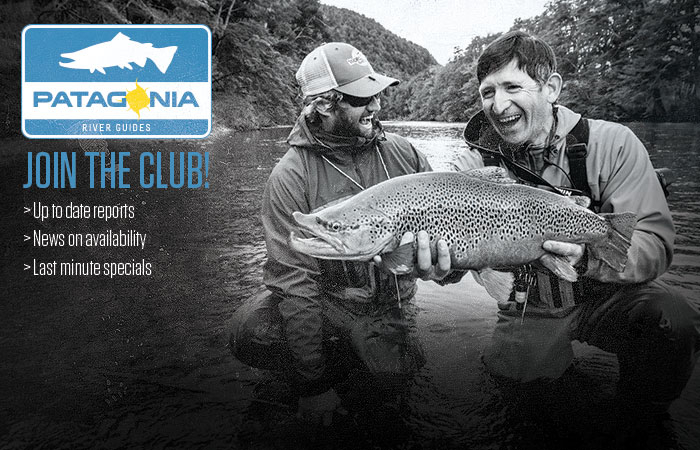 Over the years, PRG has learned a great deal about running lodges, kitchens, logistics programs, and fishing programs in Argentina – and we are confident that our lodging, food, and beverage programs are of the highest level possible without sacrificing fishing or making the program pretentious. We have more access – both private and public – than any other outfitter in Argentina and can truly fish all the rivers listed on this website while providing state of the art gear, equipment, and trucks to get our guests into places others just can’t. Finally, Rance and Travis sell and host nearly every trip so that you don’t get sold what they can’t deliver. Will I have cell service? Do you have Wi-Fi? Do I need a satellite phone? Our new PRG Lodge at Trevelin has fixed phone and continuous cell service. In addition, you will pass through cell service in many locations on the way to fishing. Devices like Blackberry, Iphone, etc. work well here and you can download your messages and also send from your device. The phone carrier in our area is mostly Movistar, if you want to check with your carrier. PRG Lodge in Rio Pico doesn’t have a phone or cell service; however, there is sporadic cell service available depending on your location. At these locations you can normally pick up 3G service. You don’t need to waste money on a satellite phone unless you need to call whenever you want to from isolated locations. We have Wi-Fi at our lodge in the Trevelin area but none in Rio Pico. We have computers to lend if you want to check your email and leave yours at home. You can also make phone calls from Skype from our lodge and the connection is normally very good and a cheap way to communicate with the office and loved ones. What if someone needs to get a hold of me in the case of an emergency? What’s the weather going to be like? What are the daily temperatures? Patagonia is much like Montana and it can be more of a guess than a science. You should be prepared in all months throughout the season for any kind of weather. You should always pack a rain jacket, layers of fleece and/or wool, gloves and stocking hat, and also, warm weather clothing like quick dry pants, fishing shirts, sun had, sun gloves, and sunscreen. If you want to have a good idea on average temperatures, check out weather underground for Esquel and the historic weather for the time you are traveling. Follow this link for in depth historical averages in Esquel. Our pre-trip travel package has a list of frequently used flies. We provide ALL flies, leaders, and tippet. You don’t need to bring any flies but you might select one box of basic trout flies that you would use in the western USA in case you want to try something or in the unlikelihood that you are separated from your guide. What rods, lines, waders, and boots should I bring? Do I need to buy and bring new boots? The best rod is a 9-foot 6-weight that can easily be packed in your luggage or one that the airline will allow you to carry on (check with your airline if you have questions about carrying on rods.) You should have a new floating weight forward line and also a 200-grain 24-foot sinking tip. We have a large selection of Winston Rods to loan you in case you don’t have what you need or need a spare rod. We also have loaner reels with 6-weight lines and the aforementioned 200-grain sinking tips on them in case you need an extra reel or line. We have Simms waders and boots for those that elect not to bring theirs or don’t have them. We have boots from size 6 to 14 and waders from small to extra large. If you like the way yours fit and perform, it is always better to bring your own! You can buy new boots if you are in the market for some anyway, if not, we have boots to loan you on this trip. If you use our boots, then you won’t have to travel home with wet boots. What rivers will I be fishing? Will I be floating or wading? Depending on the time of the year, weather, and fishing conditions, you will be fishing any and/or all of the rivers mentioned on the website HYPERLINK “http://www. www.patagoniariverguides.com/press.php”http://www.patagoniariverguides. com/press.php When you arrive, we determine what rivers are fishing best and which rivers suit each particular angler. We make daily decisions for fishing destinations based on weather and clients preferences. It is our philosophy to fish a different river daily, so you will end up fishing spring creeks, small rivers, creeks, large rivers, tail-water rivers, and also some lakes. Each destination is different and some are waded and some are floated. If you prefer wading, then we’ll try to send you on as many wade fishing trips as possible (it is possible on nice days to wet-wade and you should be prepared for that with appropriate footwear or heavy socks to fill your boots). Likewise, if you prefer floating, we’ll send you on float trips. The more flexibility we have in selection your destinations, the more places we can send you, and the more likely you will have the fly fishing trip of a lifetime. Should I bring travelers checks? How much cash do I need? Do I need Argentine Pesos? Can I use credit cards? We don’t recommend bringing travelers checks as they are difficult to exchange and the rate of exchange is normally poor. You will need enough cash to pay for some personal shopping in Buenos Aires and Patagonia. If you need a shuttle from Bariloche, you should also have cash for this. Cash is appreciated for PRG guides and staff gratuity (see pre-trip packet for suggested tipping). You can use credit cards in most places in Argentina but it is recommend to have some Argentine pesos for taxis, small shops, tips, etc. You can get small loads of laundry done from one day to the next for a minimal charge of about $10 to $15 per load. If you leave your laundry in our clothes hamper before going fishing, it is likely that your laundry will be done that evening. If there is a large amount of laundry, it will usually be done by the next morning. There is no laundry service in Rio Pico at this time but stay tuned, there just might be if by the time you get here. Do I need a converter? What kind of electricity does the lodge have? Argentina uses 220 volt electricity. The USA uses 110 volt. We have all the converters you will need to charge your digital camera, your computer, your CPAP Machine, etc; however, you might need one at a hotel in Buenos Aires. In this case, they will probably provide you with one, but taking one might not be a bad idea in this case. Look on the charger, most every electronic produced in the past 10 years takes 100 – 240 volts. It is safe to just plug them in and charge them. We do have one converter from 220 to 110 in case you have something special that can’t take the full 220 volts, which is very unusual. Both lodges have electricity 24 hours per day. Should I bring my own hair dryer? No, we have them in both lodges for your use! Save the space in your luggage!